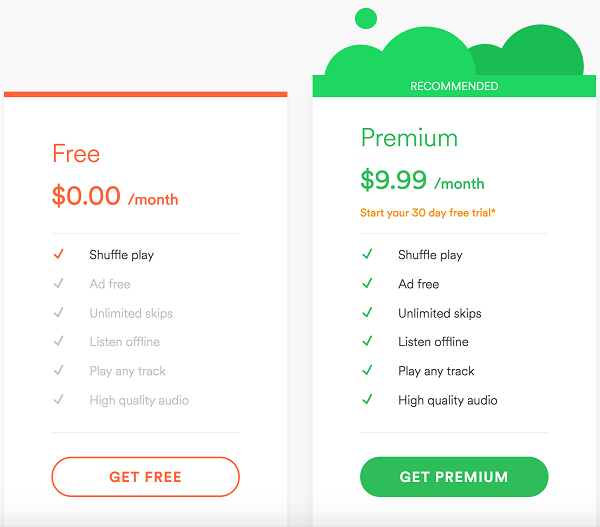 There are mainly two tiers of Spotify plans for individuals, which are Spotify Free and Spotify Premium. You don't need to pay a penny for Spotify Free but you have to endure some limitations. For Spotify Premium, you need to pay a monthly subscription fee at $9.99 and you can enjoy better music experience. Besides, Spotify Family is also available and it costs from $14.99 to $29.99 depending on the total number of family members. However, even Spotify Premium comes with many restrictions and you can break the limitation with Spotify Music Converter below. On January 4, 2018, Spotify announced on Twitter that it has 70 million subscribers. Spotify also claimed the total number of active users was up to 140 milltion in June 2017. That is to say, about half of Spotify users pay for the premium subscription and still half of Spotify users stick to free plan. If you are going to have a try on Spotify and has been a Spotify free user, you may wonder whether you should pay for the premium subscription or simply stick to free plan. Before you make up your mind, learn about the 6 differences between Spotify Free and Spotify Premium. With Spotify Free, shuffle play is the only mode you can use to enjoy streaming music. With Spotify Premium, you can enjoy different playback modes including shuffle play, play in order, repeat a song and repeat a playlist/album. Many Spotify new members asked how to make a playlist play in order, the answer is to pay for the premium subscription. With Spotify Free, you can listen to any music in Spotify, but you’ll hear ads between tracks both on computer and mobile. Sometimes, the ads may ruin your mood totally when you are enjoying music leisurely. With Spotify Premium, you won't get any ads no matter what device you are using. Everyone has his own music taste. Sometimes, you may hear some songs you don't like and you simply want to skip them. With Spotify Free, you can only skip 6 songs per hour, but with Spotify Premium, you can skip any songs you don't like without limitation. With Spotify Free, you must have a stable internet connection to stream the songs. Without a Wifi connection, it's almost impossible to listen to music unless you use data connection. But why would you use data connection as it definitely costs more than Spotify Premium subscription fee. With Spotify Premium, you can download songs to your PC, Mac, iOS, Anddoid or other supported devices and listen to them offline whenever you don't have internet connection. Spotify Premium users can save mobile data by downloading up to 10,000 songs per device, on a maximum of 5 different devices. With Spotify Free, you can listen to most tracks in Spotify library. But some new tracks or albums are only available for Premium users. The songs or albums will be grey-out for Spotify Free users. And Premium users sometims can enjoy some albums several weeks before actual release. Though it happens very infrequently. On desktop, default streaming audio quality for Spotify Free users is Ogg Vorbis 160kbit/s while Premium subscribers can choose to switch on High quality streaming, which uses 320kbit/s. On iPhone, iPad or Android, Spotify Free users can choose either 96kbit/s or 160kbit/s while Premium subscribers have one more option which is 320kbit/s. As to streaming audio quality on Chromecast, it's AAC 128kbit/s for Spotify Free, and 256kbit/s for Spotify Premium. Even if you have subscribed Spotify Premium, there are still some limitations such as only 3 devices can be used, only 10,000 songs can be downloaded and you can't enjoy Spotify offline songs on MP3 players like iPod Nano, iPod Shuffle, Sony Walkman, iRiver, Sandisk Sansa, etc. or burn Spotify offline songs to CD for your car audio system. The best solution of enjoying Spotify music without limitation is to use TuneMobie Spotify Music Converter. 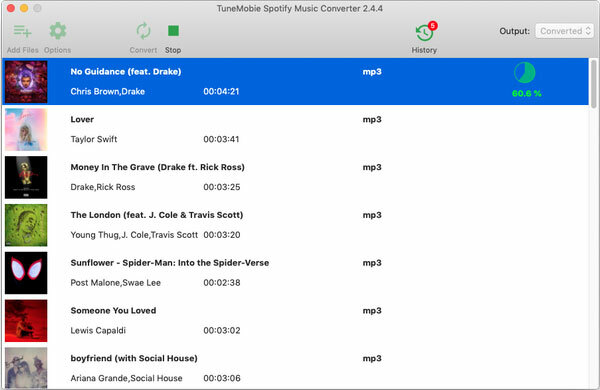 TuneMobie Spotify Music Converter can download Spotify songs, albums and playlists to computer and convert to MP3, M4A, WAV or FLAC with ID3 tags and metadata kept, no matter you are using Spotify Free or Spotify Premium. With Spotify Free and Spotify Music Converter, you can create a playlist in any media player and add songs to the playlist and play in different playback modes on demand, enjoy full pleasure without ads interruption, skip any songs as you like and enjoy them offline no matter there is internet connection or not. The actual audio quality of output songs is same as source which is 160kbit/s, and you need to wait for some time when the Premium-songs are also available for free users. With Spotify Premium and Spotify Music Converter, you can enjoy high audio quality at 320kbps and enjoy the Premium-only songs on any devices whenever they are available. After reading the 6 differences between Spotify Free and Spotify Premium, will you decide to pay for Premium subscription or stick to free tier? No matter which choice you make, Spotify Music Converter is definitely a must-have program for any Spotify users.